Horsham defender Joey Taylor starred on the international stage on Sunday as he helped his country to just their third win in 22 matches. The former Welling full-back, who joined Horsham in the summer, starred for Montserrat on Sunday in their 1-0 victory over Belize in a CONCACAF Nations League qualifier. It was Montserrat’s first victory in five attempts with former Nottingham Forest striker Spencer Weir-Daley curling home a superb winning goal in the 74th minute. Taylor, 21 qualifies to play for the tiny Caribbean island - which has a population a little over 5,000 - through his grandparents. The country is ranked 205th out of 210 teams on the FIFA world rankings list. He was making just his second appearance for his country after netting on his debut against El Salvador last month in a match they lost 2-1 to a last-minute winner; the game was Montserrat's first international game for three years. 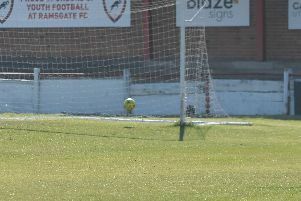 The left-sided player was the first-ever player to graduate from Welling United’s development squad, signing a contract at the National League side in 2015 and going on to make ten first-team appearances. Taylor, who has made 11 appearances for the Hornets this season, has also played for East Grinstead Town, Leatherhead, Burgess Hill and VCD Athletic.